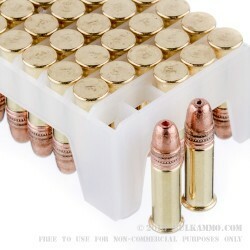 One of the best mainstream .22LR rounds available, this is a case lot of 500 rounds of the Federal Ammo that is balanced for general .22LR use and offers exceptional harmony across the board for the users of the .22LR. 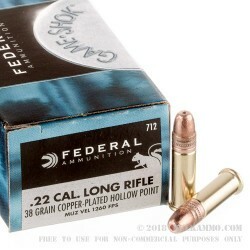 This is a 38 grain hunting centric design that can easily be used for target work, plinking or other general use by the shooters of any type of .22LR firearm, from tube fed rifles to revolvers to the most difficult to function semi-autos. 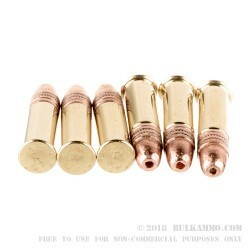 The low fouling from the copper plated hollow point projectile and the relatively clean powder burn offers a more shooter friendly option for those who don’t want to have to clean their guns all the time during long range sessions. The price is right for those who want a cheap round to do basic work with, but it is exceptional for those who actually need the terminal ballistics of the hunting specific build. Perfect for small game and small birds, this is a potent offering with the 1260 feet per second velocity and the nicely sized projectile. 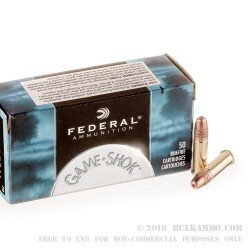 This is a reliable, proven, and well-priced ammunition for bulk shooters who need premium consistency without the hassle of most mainstream value priced ammunition.